After a close loss last week at the hands of Little Three rival Amherst, the Cardinals needed a victory on Saturday. The Cardinals’ balanced offensive attack helped them take and keep a commanding lead to pummel Bowdoin. Even though Bowdoin’s losing streak is now seven games, the Red and Black still played a strong game, improving in many aspects that had plagued them in prior weeks, such as turnovers. With that said, the Red Birds were still hindered by penalties, giving up over 100 yards in total. On offense, Mark Piccirillo ’19 was at the center of success as the team’s leading passer and rusher, combining for over 300 yards of total offense with three passing touchdowns and zero turnovers. On defense, Brandon Morris ’19 and Shayne Kaminski ’18 combined for 17 tackles, three of which were tackles for loss. The first quarter started off slowly despite a strong opening drive from Bowdoin to the Wesleyan 41-yard line. Beyond forcing a punt, Wesleyan could not pick up momentum and had a three and out on their first drive. However, with advantageous field position, Bowdoin was able to drive into the Cardinals’ red zone and take an early lead with a field goal. The Dirty Birds did not stand idly by and came back onto the field with a vengeance. Thanks to a poor kickoff, the offense started their last drive of the first quarter at the 40-yard line. After a foolish penalty by Bowdoin, the Red and Black were soon in the red zone. With strong running by Piccirillo and Sean Penney ’21, the Cardinals quickly made it to the goal line and secured a lead, one they would retain throughout the game, with a touchdown pass to star receiver Mike Breuler ’18 in the back of the end zone. Seemingly knocked off balance and into the water, the Polar Bears could not gain a 1st down on their ensuing drive and were forced to punt after just three downs, giving Wesleyan the ball back at their own 24-yard line. The offense, behind a balanced rushing and aerial attack from Piccirillo, Penney, and Gernald Hawkins ’18, drove down the field before the Cards’ star quarterback launched a 20-yard dime to give Breuler his second touchdown catch as Wesleyan took a 14-3 lead. But the game slowed down over the next two drives; neither team could manage to start rolling again. That was until Wesleyan forced a turnover on downs thanks to Kaminski, giving the Cardinals the ball back on the 50-yard line. 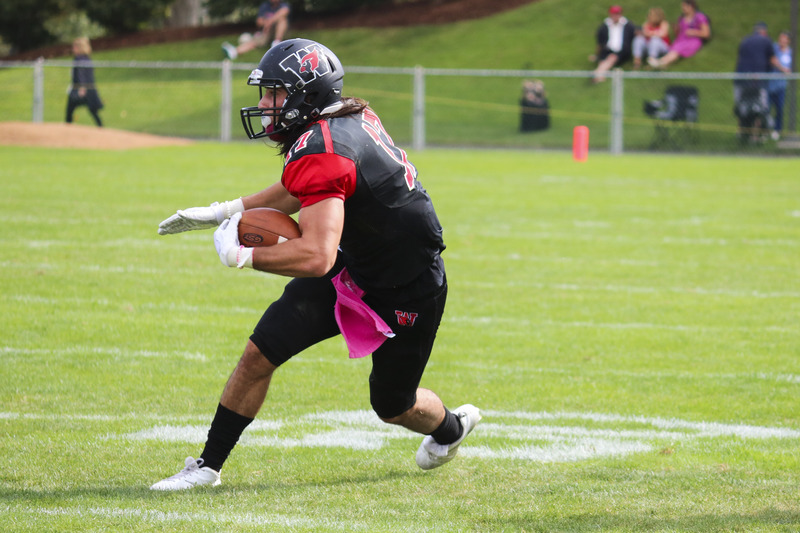 Despite a drive that brought them to the Bowdoin 30-yard line, costly penalties took away valuable yardage and the Polar Bears managed to block the Cardinals’ field goal attempt, which would have given Wesleyan a commanding two-touchdown lead. The third quarter started dismally, with neither team quite able to recapture the dynamism of the first half. A woebegone four consecutive drives ended in punts or turnover on downs to start off the quarter. Wesleyan kept on generating yardage on offense, but also kept on committing penalties on big plays that completely negated the gains and stalled out drives. But on the last drive of the third quarter, the Cardinals began to penetrate. Thanks to a fantastic play by Breuler and Piccirillo and then a foolish penalty by Bowdoin, Wesleyan was soon in the Polar Bears’ red zone. On the first play of the fourth quarter, Piccirillo threw to Breuler once again to secure their third touchdown connection of the day, extending their lead to 18 points. The fourth quarter continued favorably for Wesleyan as they forced another three and out, laying the groundwork for another dynamic offensive drive: a brilliant pass to Hawkins for 36 yards down to the Bowdoin 12. But after failing to make into the end zone after three downs, the Cardinals attempted to get a touchdown on the 4th down and failed, giving up the ball with no points to show for it. Though the offense struggled to score at times, the Red Birds defense stood strong, forcing another punt and leading to another faulty drive on Bowdoin’s side of the field. But suddenly, on their first play of the drive, Bowdoin’s quarterback completed a miraculous 85-yard touchdown to a receiver who was wide open in the middle of the field. This cut Wesleyan’s lead down to 21-10. However, neither team scored again in the rest of the fourth quarter, despite Bowdoin reaching the Wesleyan 8-yard line on one drive. Wesleyan secured their fifth victory with a knee to burn the final few seconds of the game. Hopefully, this win over Bowdoin will help get the team back on track after their difficult loss to Amherst. The final leg of the season will determine whether the Cardinals are pretenders or contenders in the NESCAC. Although Williams, their next opponent, is a strong team, the game is on Wesleyan turf and the Cardinals are yet to be defeated at home.